Ok so if you're sick of my travel posts, don't worry, THIS IS THE LAST ONE. 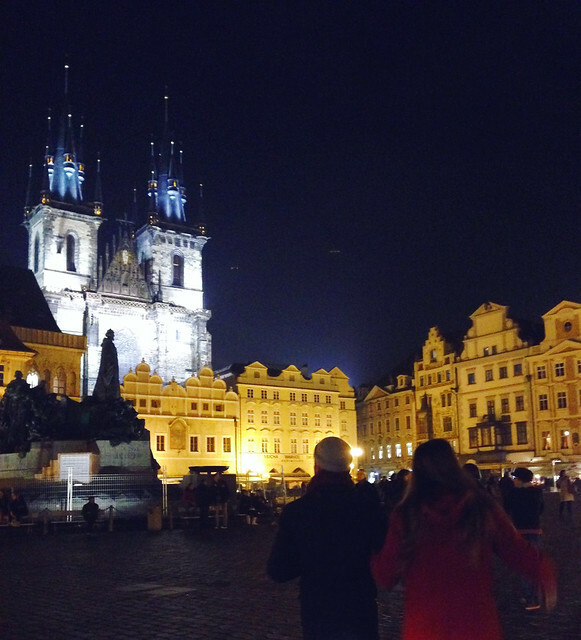 It's kind of long, but I have a lot to share about Prague! On the final weekend I was in Berlin, my brother had a three day weekend, so he, I and his lovely girlfriend Gesine took a trip to Prague. 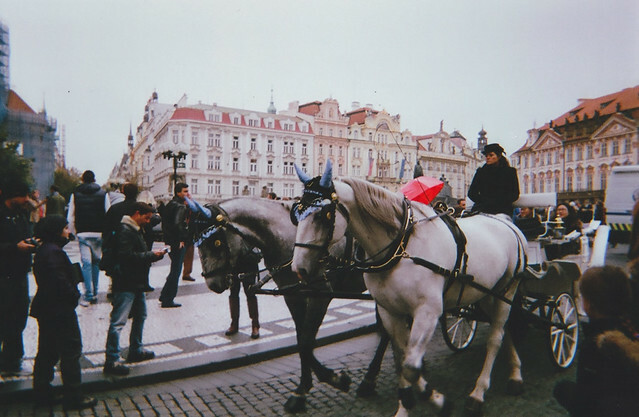 I've always heard people say, oh I love Prague! But no one is every really that specific about why, so I wasn't even sure I was going to go. I'm so glad we did! 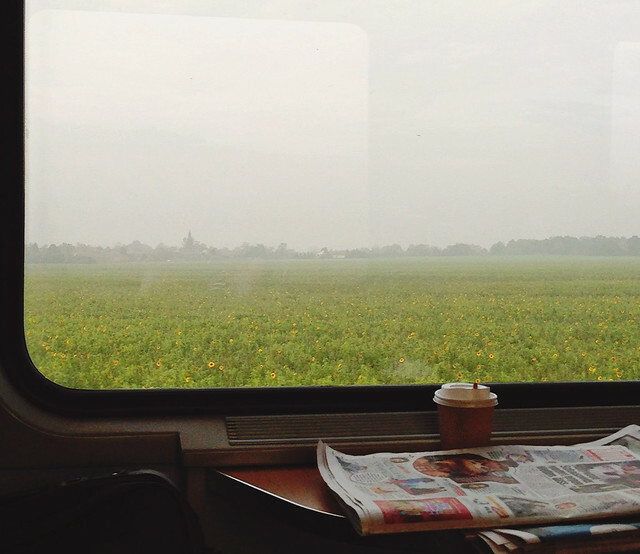 We rode the train from Berlin, which was a 4-5 hour trip. It was a very nice ride, going through sunflower fields, and then through a beautiful mountainous river gorge with the occasional castle ruin. Also can I just have a moment of joyful tribute to rail travel? We need more of that here. We stayed in an AirBnb apartment that was absolutely perfect. It was only about a 7 minute walk right to the Old Town Square, which is the historic/tourist center of town, and definitely cheaper than the hotels in the same area. Apparently I decided to stop recording right when they got rowdy. But here's another video of these same guys playing [with better shots of their ELF SHOES] if you need more. 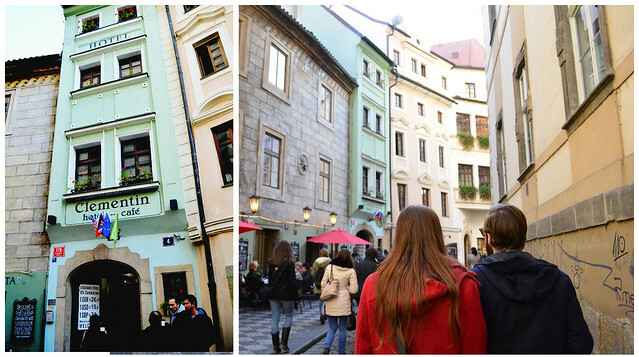 Prague is an old, old city that used to be one of the most influential centers of power and culture in Europe. It was the capital of the no-longer-existing Bohemian Empire and, for a time, the capital of the Holy Roman Empire. In the 14th century it was basically THE place to be in Europe. And unlike many of Europe's other large cities, it did not see a lot of fighting or destruction during either World War, so much of the old architecture remains. Here is the Old Town Square at night. Up at the tops of those spires are little windows in little rooms - you can see them lit up. So I suppose that's where the wizards live. The Old Town area is not big at all - you can walk from one end to the other in 20 minutes - but it is full of those narrow, twisting, completely unplanned streets you find in very old towns. Every time we were in between activities or food, we just walked around, and every time we found new little streets or discovered another pocket with a cafe or bar. Look at this tiny little mint green hotel! 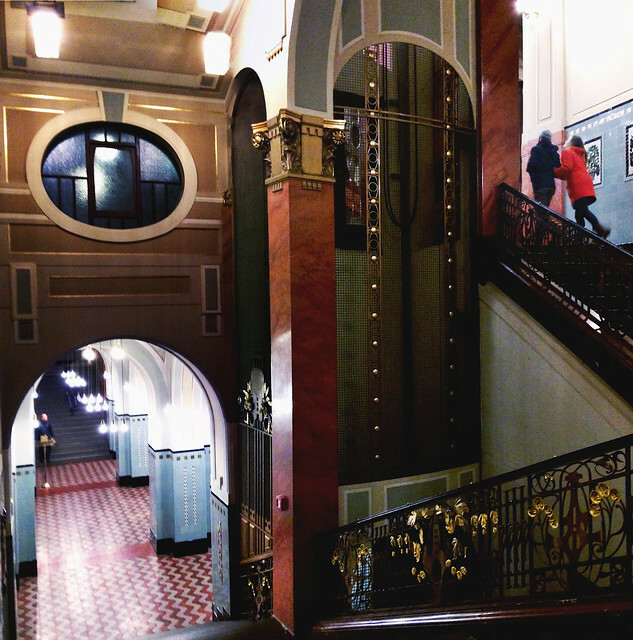 One of the places we found and ducked into was the Prague State Opera House, which [google image search will help confirm this] was like ducking into the set of Amadeus. There was a formal event going on but we just darted around the lobby avoiding important looking people. 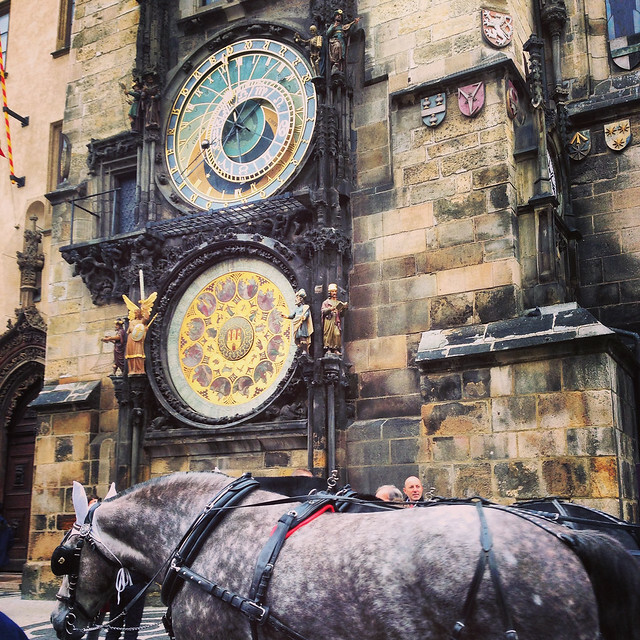 This is the Prague Astronomical Clock, a main tourist attraction on the square. It was built in 1410, and it's still working. It was quite a feat for its day: it mechanically keeps track of a bunch of different things in unison, like time, sunrise/sunset, and the positions of the planets. It's pretty amazing when you think about it. Legend has it that the maker of the clock was purposely blinded on order of the Prague Council so he couldn't make one for anyone else. 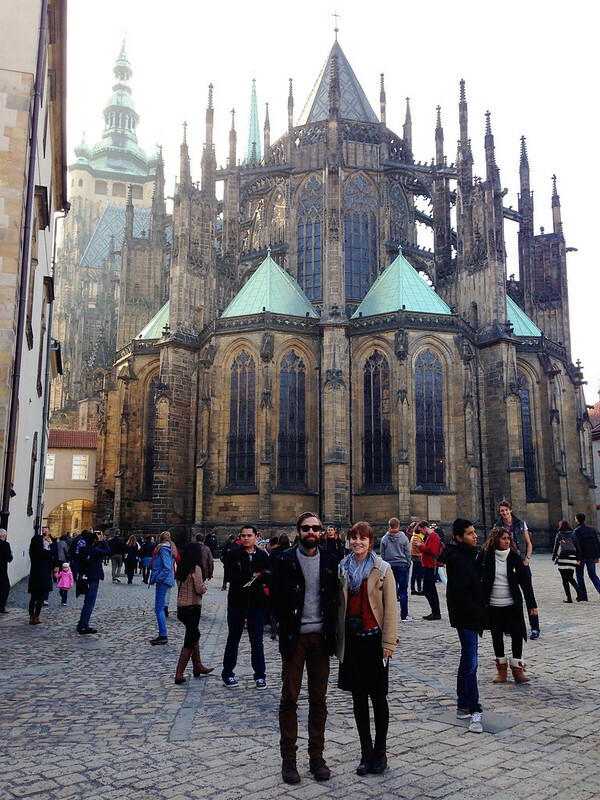 On Saturday we went to the Prague Castle, which is another one of the main touristy things to do. It's huge! And beautiful and amazing and up on this incredible hill. But it was also kind of a cluster. When we got there they were out of audio tours AND guided tour spots, so we just walked around with a teeny map. There are barely any signs and so many parts without any kind of explanation or historical info. And when I'm in a medieval castle, GIVE ME ALL THE HISTORIES. 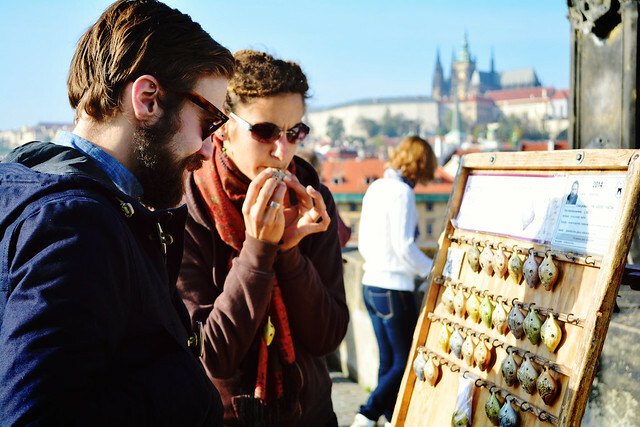 This is Ian buying some kind of Czech flute thing on the Charles Bridge. 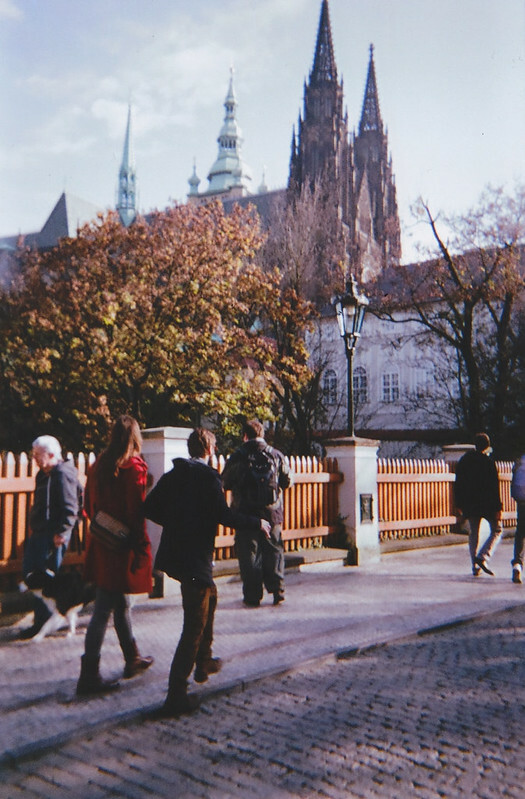 In the background is the hill of Prague Castle. 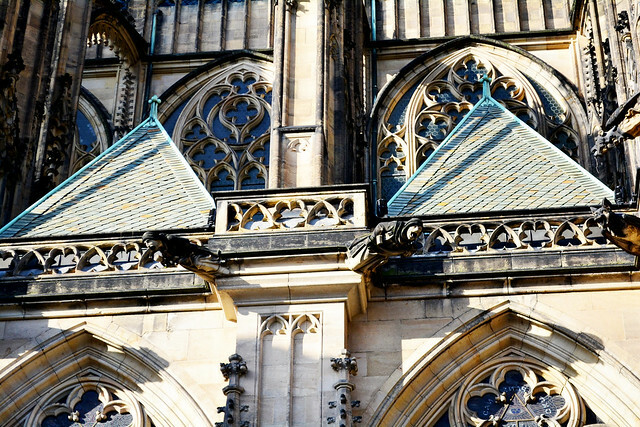 The main spires you see when you look up at the castle hill actually belong not to the castle but to a massive cathedral inside the castle complex called St. Vitus Cathedral. It is spectacular and giant. 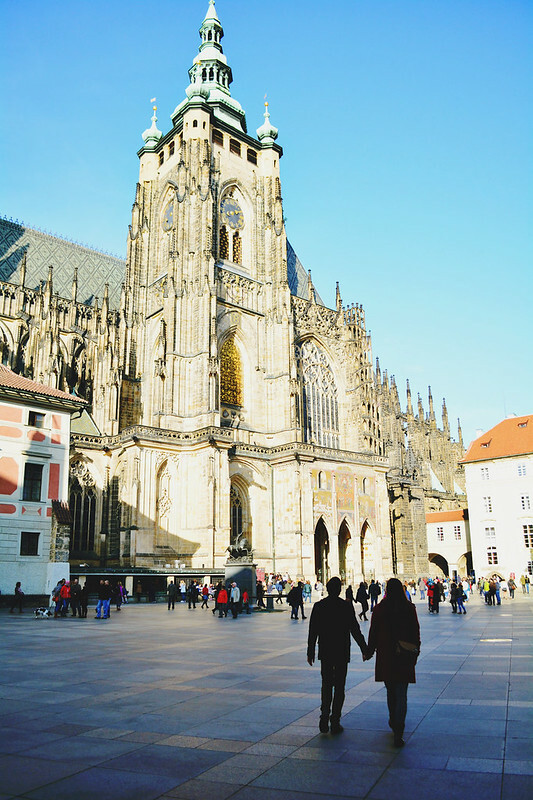 There have been a few cathedrals on this site dating back to 930, [including one built by King Wenceslas, as in, the Christmas song], but this one was started in 1344. 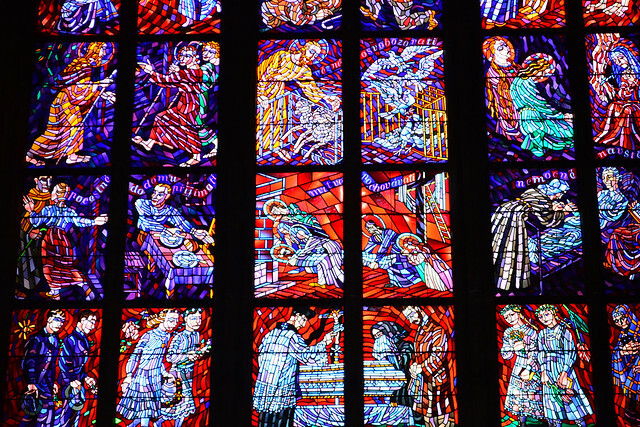 The inside had the most intricate and luminous stained glass windows I've ever seen. Here's a closeup of one. That's probably ten vertical feet in the picture, and the whole thing was easily two and a half times taller. And there were dozens of them. The outside had the world's most disturbing gargoyles. Way to be freaky, 14th century. 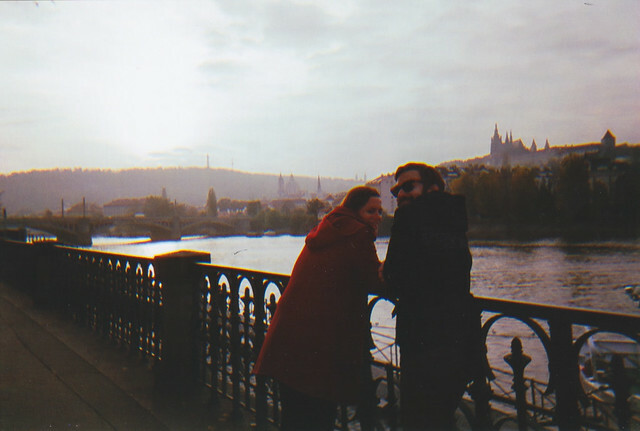 By the way, if you think the subtitle of this post should be "Devon Takes Many Rear Lurker Photos of Ian and Gesine's Romantic Prague Getaway", well then I wouldn't wholly disagree with you. But I promise it wasn't like that in real life. That's just what happens when you're always walking behind your vacation comrades. Speaking of comrades, on Saturday night we ate at a restaurant on the recommendation of our AirBnb host called Lokal. 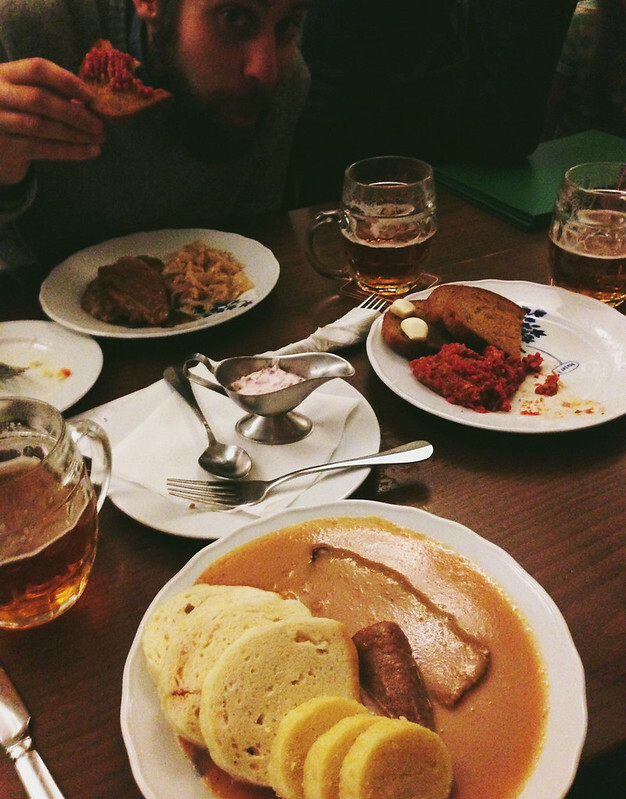 She said it was a good place to go if you wanted an authentic Czech restaurant food the way it would have been 30 years ago - in other words, before the fall of the Iron Curtain. I know the food isn't very pretty to look at but it was soooo good. I had some kind of pot roast and gravy situation with bread dumplings and potato dumplings. The beer was called 'cream beer', and basically was like cream soda and beer got together and made something that tasted a bit like toasted marshmallows. The red stuff is beef tartar to spread on buttered garlic toast, which was also really delicious. Gesine, who was born in East Berlin, said that a popular East German party appetizer was a ball of beef tartar with a bunch of cracker sticks poking out of it so that it looked like a hedgehog. I enjoyed that tidbit immensely. 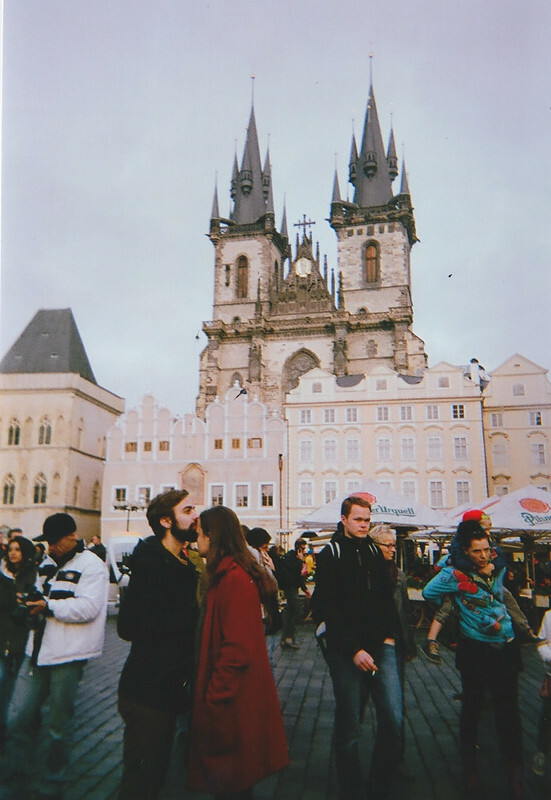 Gesine brought a disposable camera for each of us to use, which was such a good idea! I hadn't used one in forever, and it actually made me miss them. The almost-painful thumb cranking, the satisfying spring loaded shutter click. And I'd kind of forgotten how pretty and atmospheric film is. Plus you actually have to think about taking a picture since you don't have very many. I don't know what's happening in this picture [sorry Ian] but the castle looks good. 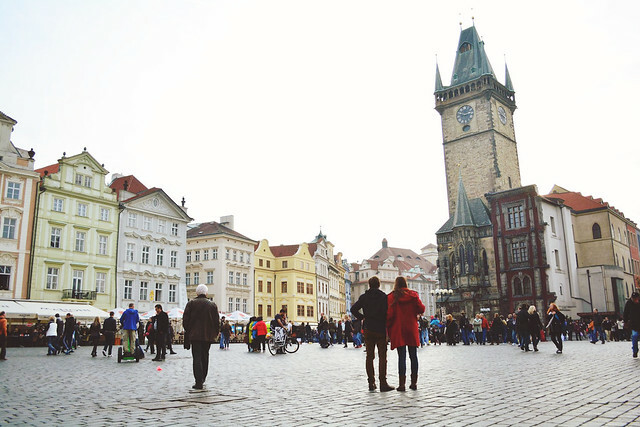 It's true that there's not one specific thing that stands out as the reason to go to Prague, but you really do just love it. I think it's mostly because of the feel of the place - it's enchanting. It almost seems like a set. At night, everything is lit, and soft yellow light bounces off cobblestones and gilded eaves. The castles and cathedrals look like paintings from a fairy tale. Even the crowds, which are usually a turnoff for me, add to it somehow: a multitude of languages blend into the single, buzzing energy of happy people, caught together under the spell of a medieval city.